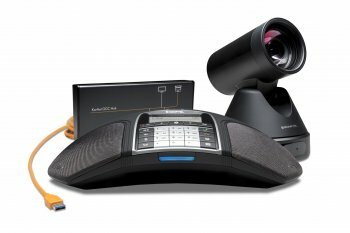 Konftel C50300 Hybrid is a flexible range of premium video collaboration solutions for medium and large meeting rooms, combining the Konftel Cam50 PTZ conference camera and a Konftel 300 model with OmniSound audio quality. The Konftel OCC Hub brings the whole kit together, so a single USB cable is all you need to connect the camera, the conference phone and the room’s screen to the collaboration app on your laptop. The hybrid concept also delivers the freedom to welcome participants via regular phone calls. The Konftel Cam50 brings exceptional image quality to your video conferences at a fraction of the cost of other comparable conference cams with PTZ (Pan-Tilt-Zoom). It is based around premium class optics and outstanding precision – all the way from the lenses to the image sensor and the technology used to optimize the quality of the video. Even in low light, the image is crisp and clear. Konftel OCC Hub is, as the name suggests, the hub of the video collaboration solution, offering One Cable Connection to the conference camera, speakerphone, and screen. In practice, this means that C20Ego fully supports BYOC – Bring Your Own Computer, where the user can bring the collaboration service to the meeting room on any laptop with a USB port. With the Konftel C50300 Hybrid, you’re not limited to VOIP calls in the collaboration app on your laptop. You can welcome participants via regular phone calls. The Konftel 300 series offers true conference phones with both USB and different types of telephone lines. Choose the model that matches your company’s telephony solution: Konftel C50300IPx Hybrid for IP telephony, Konftel C50300Wx Hybrid for wireless DECT or Konftel C50300Mx Hybrid for 3G/GSM. What you get is a flexible premium package for video conferencing with phone calls as a back-up. We call it Hybrid Conferencing. Medium and large meeting rooms are the PTZ camera’s natural habitat. A 72.5° field of view creates a sense of presence right from the start and it’s easy to zoom in to a suitable level. And you can test the Konftel Cam50’s performance by taking the 12x optical zoom all the way. Show notes on a whiteboard or details of a product sample with impressive clarity. The conference phones in the 300 series are optimized for meetings with up to 12 participants in the room. By adding extra microphones, you can expand the effective audio coverage for large video conferences with up to 20 people.